A computer is programmed to produce a long string of Hs and Ts which are printed out onto a piece of ticker tape which has been divided into square boxes. Each time a button is pressed the tape advances by one 'unit' and the bottom box cut off, so there are always three boxes visible in a line. The number of units of paper remaining inside the machine is indicated in the circle. Alan Turing, the great code breaker, and I are each given a slip which we each mark with Hs and Ts. Whoever sees their sequence emerge first from the machine wins. 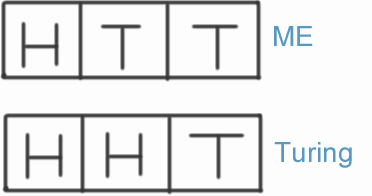 I choose HTT and Turing chooses HHT as shown in the diagram. 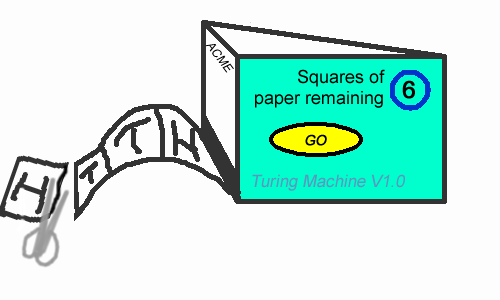 If the machine configuration is as shown in the diagram at the moment, who is more likely to win: Turing or me? Suppose we were going to play again and Turing chooses the sequence THT. Being a bit of a spy, I find this information out before I choose my sequence. Before we play we are going to reload the machine so that it contains 6 units of paper. Can I choose a sequence which is more likely to win than Turing's? Difficult Extension: After playing with these choices many times, Turing is fed up with losing and wants to choose TTH. He also wants to load the machine with infinitely many units of paper. Can I choose a sequence which is more likely to beat Turing's new choice? Experimental probability. Curious. Resourceful. Combinatorics. Conditional probability. Theoretical probability. Real world. Combining probabilities. Summation of series. Tree diagrams.